Before coming to UNT, I had heard that graphic design was very typography heavy. That sounded so boring to me. For a while, I lost interest in becoming a graphic designer. But after getting into my very first Communication Design class, I began to realize there was more to typography than simply laying out paragraphs on a page. And of course, hand drawn type! It was hand drawn type that jump-started my love for typography. Simple, brush style handmade type is extremely popular right now and easy to find on sites like Pinterest, Tumblr, and Instagram (not to mention all the DIY-ers everywhere), but there are also designers out there who make a living creating amazing typography for magazines, websites, signage, and logos. Keeping up with all the greatest typographers is easier than ever with portfolio sharing sites like Behance and Dribble. Here at Square 205, we enjoy using Instagram to like, follow, and share our favorites, see their works in progress, and get to know their personalities and inspiration. 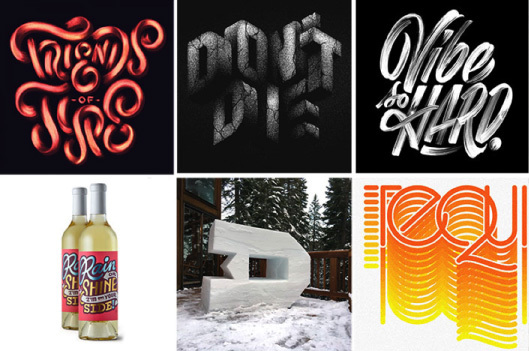 Here are several amazing typographers I’ve discovered through social media who continue to inspire. I recently found El Juantastico on Instagram and we have completely fallen in love with his bright 80’s inspired hand lettering and illustration that fits right in with the colorful lifestyle and scenes of Miami Florida where his studio is located. 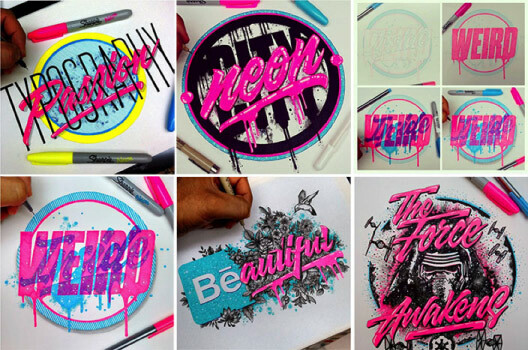 He uses bright neon colors with handmade texture like no artist we’ve ever seen. All the movement and attitude in this work is created with pretty humble tools; just Sharpies and Micron Pens with a bit of help from a white gel pen to create those detailed highlights. 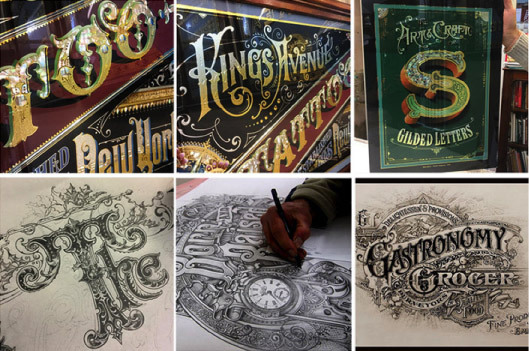 I have been following Tobias Hall for quite some time and he has become our go-to for vintage, detailed, apothecary signage type of type when I need inspiration. But he doesn’t just do old-fashioned detail orientated stuff. Some of his work is modern and digital for magazines, menus, logos, and adds. He is surprisingly young for someone who has worked with huge brands like Toyota, Netflix, and Converse but it is his personal projects and freelance work I enjoy the most. My first impression of Gemma O’Brien, was her work in progress of a larger-than-life-size mural of a quote by Julia Childs. “People who love to eat, are always the best people.” The quote is surrounded by greenery and flowers in an eye catching typographic illustration. Her style is organic and often incorporates nature but with limited color pallets, often monochromatic or in black and white, it is also very graphic. 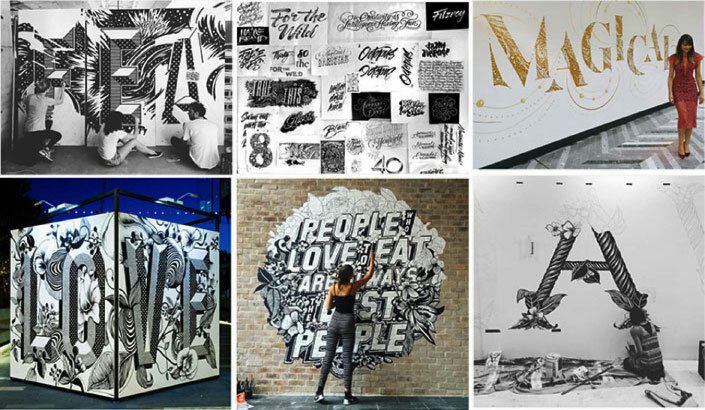 Her work has an amazing amount of motion and texture that she can create with just black and white, and each of her murals seem to be miraculously more detailed than the last. If you are an aspiring typographer or letterer there are tons of websites and blogs out there for typography! Friends of Type is a site I have followed for years after meeting Eric Marinovich who came to Dallas to speak to students and local artists. Marinovich founded Friends of Type with a small group of amazing typographers, including Aaron Carambula, Dennis Payongayong, and Jason Wong. 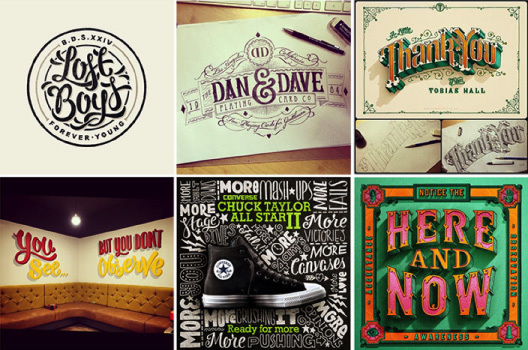 They post a new typographic sketch or illustration nearly every day as well as a new featured artist’s work once a month. I would highly recommend subscribing or casually checking in on this one! Here in Denton we have some of our own crazy amazing typography. Sean Starr of Starr Studios is a sign painter from San Antonio and after some time in California he re-relocated back to Texas. Starr Studios is responsible for signage such as the famous Jupiter House sign, the Bookish Coffee sign on the West side of the square, every bit of type you see at Rusty Tacos, Bulls Eye Bike Shop, and even those City of Denton Bike Racks on the North-West corner are his handy work. Starr is a huge advocate for traditional sign painting, an art that was almost lost after vinyl letter printers were invented. Starr even produces Traditional Sign Magazine and played a part in the making of Sign Painters the movie. 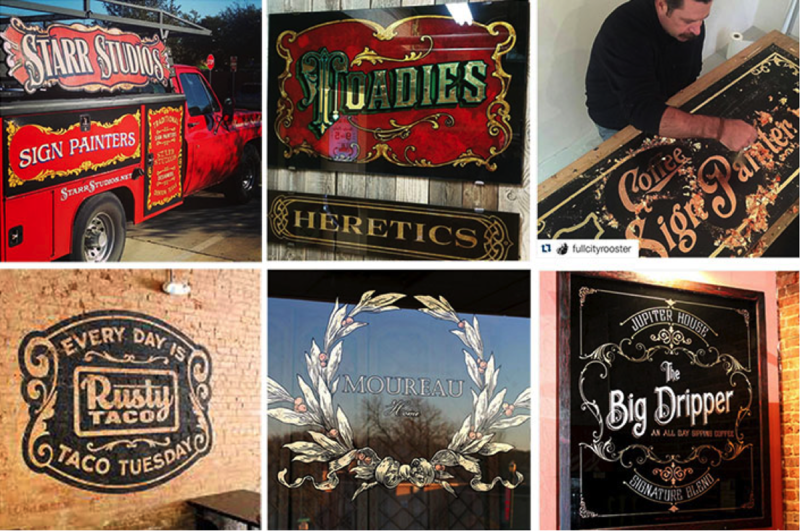 He even has a podcast called “Coffee with a Sign Painter” where he interviews other sign painters as well as some of his customers like the Toadies, after creating their most recent album cover. You can spot his truck driving around town every once in a while. It’s a big red truck with “Sign Painter” on the sides. You can’t miss it! Every time you step outside in Denton you are bound to see Jude Landry’s work. His “Oh no you Denton” t-shirt and tanks are so popular that he has had a hard time keeping his shops stocked since releasing them last year. If you don’t own one I know you have at least seen them. If there is one thing that Dentonites can agree on it’s their love of Denton and Jude has really read his targeted audience well. Jude is a local (moved here in 2014) screen printer, illustrator and typographer teaches graphic design at UNT. 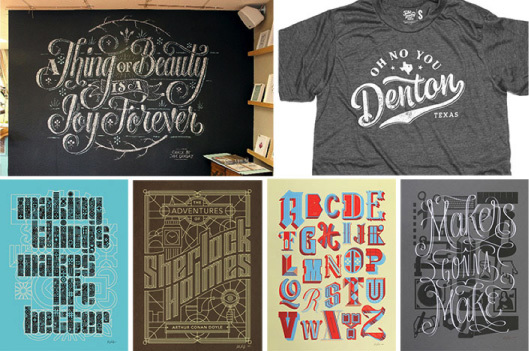 Go check out his typographic holiday chalk mural at The Dime Store, the place you can also go buy his prints, shirts and other fun screen printed goodies. Social media has become a great way to find new artists. I use Instagram just as much as any design site when looking for inspiration. As if anyone needed any more reason to stare at their phone, here are a few more typography Instagram accounts to check out @thedailytype, @designspriation, and @type_matters! If we insist on melting our brains with never ending mindless scrolling we might as well throw some wicked sweet art in there with all the other gobbledygook and while you’re at it, don’t forget to follow us on Facebook and Instagram at @square205 for updates on our projects, works in progress and fun bits of our everyday life in the office!